Center frequency is 500 Hz. Drift is extremely low in this sound card/computer. Room temp ranged from 71 to 76 degrees. A HP Z3801A was the reference for a HP 3336b synthesizer set to 500 Hertz which was connected directly to the sound card. Software is SpectrumLab set to 32/32K. Room temp ranged from 71 to 76 degrees. This sound card is an internal part of the Compaq notebook computer. 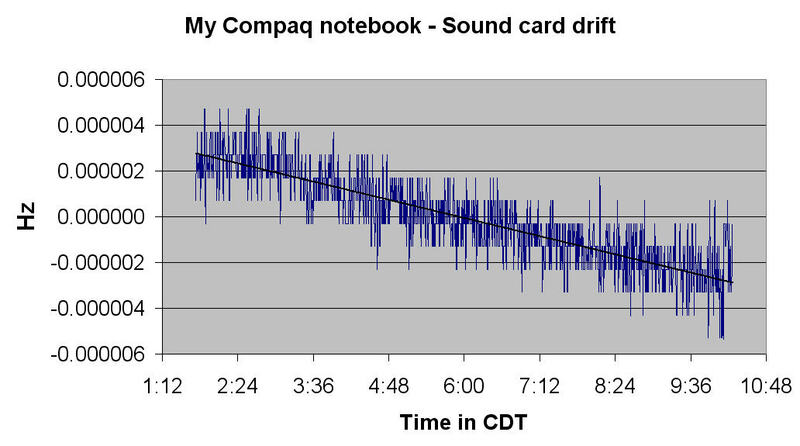 Sound card drift over this four hour period is about 250 micro Hertz. The temp in the shack was going up during the measurement period. Unfortunately I did not track the exact temp rise, but was about around 4 to 6 degrees F.
A HP Z3801A was the reference for a HP 3336b synthesizer set to 1000 Hertz which was connected directly to the sound card. This sound card is in my old desktop computer I use in the shack. My notebook computer is considerably better than this.